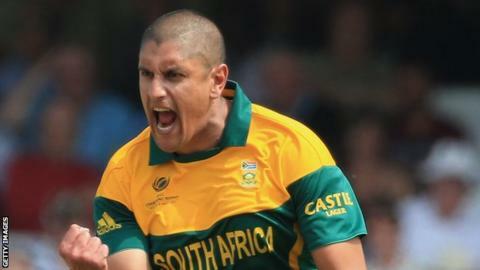 Northamptonshire have offered a contract to South Africa all-rounder Rory Kleinveldt for the 2014 season. The overseas signing of Jackson Bird fell through because of injury and 31-year-old Kleinveldt is Northants' new target, BBC Radio Northampton reports. But the Wantage Road side will need clearance from the South African Cricket Board before the right-hand batsman can sign. The Proteas' tour of Sri Lanka in July could prove a complication. However, Kleinveldt has not featured in any international match since July last year. He has played four Tests, 10 one-day internationals and six Twenty20s for South Africa and has been playing first-class cricket for the Cape Cobras this season. Kleinveldt would be a welcome arrival for David Ripley's side, with the loss of Australia's Bird coming after the news that one-day captain Alex Wakely is injured for the season and all-rounder David Willey will miss the start of the campaign. Northants tried to sign the Cape Town-born seamer for last season, but eventually withdrew the offer.